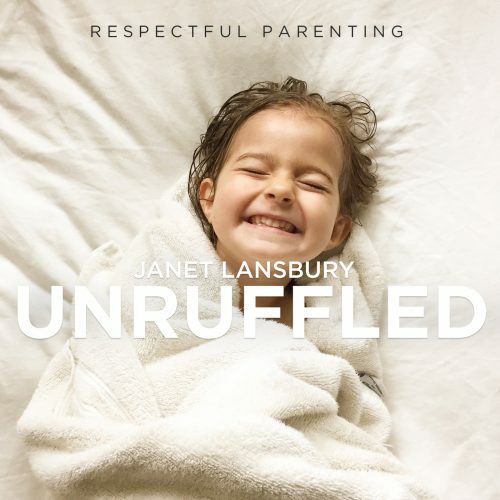 In this episode: Janet is joined by Lisa Sunbury to provide insight and answers to a mom who says she is spending hours every night trying to get her 21-month-old to sleep. Her daughter refuses to stay in her bed alone, and this mom is frustrated and sleep deprived. 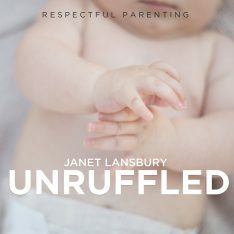 Janet Lansbury: Hi, this is Janet Lansbury and welcome to Unruffled. Today I’m joined by my friend and colleague, Lisa Sunbury. I’m so excited. We’ll be responding to an email from a mother about her toddler’s sleep issues. Lisa Sunbury, if you’re not aware of her work, she’s spent over 20 years working in early childhood educating, advocating for infants, toddlers, and their parents. She has a Master’s degree from Lesley University and she trained to become a RIE associate under the guidance of my mentor, as well, Magda Gerber. She’s taught RIE parent/infant guidance classes. She consults for childcare programs and mentors adults in the RIE approach. She generously hosts and contributes her time to answering questions in a group on Facebook that has 35,000 people interested in learning more about Magda’s approach. She offers private consultations to parents through her website, RegardingBaby.org. Most importantly, she’s my friend. I couldn’t be doing this work online without her. I depend on her. I’m so excited she’s here. Okay, Lisa, are you still there? Janet Lansbury: I want you to bear with me, Lisa. I’m going to read this question and I want to get your feedback on it right away. I just feel like I should clarify why, out of almost 100 podcasts that I’ve done now, why I haven’t done one on sleep yet. There’s a reason that I don’t feel as confident advising on sleep as I do on other parenting issues. People that request consultations that come to me about primarily sleep issues, I tend to refer them to Lisa. The reason is that I actually once did think I knew something about sleep. My two daughters were and still are awesome sleepers. They’re both adults now. They were this annoying child to other people who when friends were over at our house, my child would be the one coming out in the late afternoon and saying, “Mom, could you please take me for a nap?” They loved their sleep. Yes, there were rough patches as there always are with children with sleep. There were times when we went on trips or there were other transitions or they were teething or developmental things going on with them that were activating their brains and making it harder for them to sleep. But generally, they were great sleepers. I obviously thought I knew something at that point. But then I had my son. My son is a high-energy guy. He’s Mr. Happy. He’s a joy to be around. But from the time he was a baby he had a really hard time settling down for sleep. In the beginning it was colic. He’d be up crying in the night and be just there holding him. There really wasn’t much I could do. Later, it took him a long time to wind down and get to sleep because he just didn’t want to let go of life. He had all this energy and it took a long, long time. It got to the point with him where it was taking longer to help him down for a nap than he would actually sleep for. It was always a struggle and we ended up doing something often that, now, I look back fondly at. I would lie own in bed with him and he would fall asleep eventually with his hand on my heart. He was our baby. I was an older mother when I had him. For a lot of reasons, I just turned into mush with him and was very humbled in terms of sleep. Other times it was aggravating. I would always fall asleep with him, of course, and then to get the rest of the stuff I had to do done with my daughters and whatever else I was doing that evening, I had to dig myself out of this really deep hole of being sound asleep. Anyway, I’ve been humbled. I feel like I really don’t know that much about sleep anymore. I can still advise, but I don’t have confidence telling people to maybe try things that I couldn’t do. For that reason and a lot of other reasons, actually, I’m really excited to have Lisa here to help me answer a sleep question. Also, if any of you are in or near the Santa Cruz area, October 7th, is it October 7th, Lisa? Lisa Sunbury: It is October 7th. Janet Lansbury: Okay. For a second I was worried that I was getting it wrong. We are going to be doing a Q & A symposium together and I’m very, very excited. I hope some of you will join us for that. You can get the information on Lisa’s website, RegardingBaby.org., and get your seats. They’re filling up quickly. Anyway, I’m just excited because Lisa, she’s just wise about so many things in regard to parenting, but she also really is able to fill in where I’m weaker. I think we make a great team. “Hello. I’m writing in hopes that you can shed some light and wisdom on my current situation. Maybe there’s an obvious answer, but I’m too sleep-deprived to see. About six weeks ago, my daughter switched to a toddler bed. She was 21 months but started jumping from her crib. She also seemed to dislike being caged and bedtime was taking an hour or more each night. The transition was for both our sanity. At first she seemed a little scared in her new bed, so when she came into my room at night I didn’t mind walking her back to bed and sitting with her until she fell asleep. Well, fast forward six weeks and she’s still doing this every night. Sometimes we spend hours in her room. I have hurt my back from laying on her floor and haven’t had a full night of sleep in that time. Well, really, in almost two years, but you know what I mean. Lisa, what do you think? Lisa Sunbury: I think that this little girl needs boundaries. I think that she still needs the safety and the security of, if not the crib, then her room with a gate at the door or the door closed. The transition from a crib to a bed often goes better when the child is three years old. But if a child’s climbing out of a crib, there’s worry about safety. Parents will sometimes make that change earlier. But the two-year-old, or this little one is 21 months, still needs the safety and security of a clear environmental boundary. As well as clarity on the parent’s part, that the parent has trust, that her parent has trust that her room is a safe place, that her child can go to sleep on her own. She might not like it, but she can. Projecting that confidence, having that trust in her, and projecting that confidence. If parents are feeling uncertain and aren’t trusting, then the toddler will pick up on that. It was interesting to me that this parent said her daughter seemed not to like to be caged, and then later said, “I want her to be able to get me if she needs me. I don’t want her to feel that she can’t.” Well, even if there’s a gate on the room, even if the door is closed, she can still call to her mom if she needs her and her mom can respond. Having that boundary there doesn’t stop the child from calling if she needs and doesn’t stop the parent from responding. The parent’s not abandoning the child here. Lisa Sunbury: But I think there’s a need to have a really positive attitude about sleep to prioritize sleep for the whole family. That sometimes is lacking, and seems to be lacking here. The parent is sacrificing her own sleep, her own needs. Lisa Sunbury: She feels like she’s supporting her child in staying with her for hours so that she can go to sleep in her bed. But with toddlers, sometimes the message that they might get is that something is wrong, that they’re not safe, that they can’t do this on their own if the parent is staying. The parent is conflicted about leaving. There’s a big difference between supporting the child, giving the child the boundary both verbally and in the environment. To me, the child said you can’t make her sleep. One of the things we look at is creating the environment that will allow her to relax, to let go, that will give her the message that it is time to sleep. Sometimes with toddlers, it’s healthful to say, “I’m going to leave and I’m going to let you try to rest. I’m going to go the kitchen and wash the dishes” or whatever it is that you’re going to do. Let her know where you will be and let her know that you will check in on her in 10 or 15 minutes, or before you go to bed. Then follow through with that. Janet Lansbury: Yes, letting go. This is something that’s actually more loving than our holding on there in ambivalence. For me, with my daughters it was very easy to follow Magda’s advice to make sleep this positive thing. When we were going through rough spots, we were able to get back on track using Magda’s holistic approach of the whole predictable day and the communication. With my son, we gave into something that we knew that we were being party to. That was okay with us. In a way, we were letting go there. But through our letting go and helping our child to let go… But if the parent is on the fence, if the parent is unsure, “Well, is this okay? This is what I want to do,” the child has no choice but to hold on. Sleep is about letting go for all of us. There’s no way we can fall asleep if we can’t let go of our day, let go of our feelings, let go of pent-up stress of the day. We’ve got to release. To help children do that sometimes can look like we’re being mean, we’re not doing what they want, we’re not giving them what they want. But that is what parents are for, we’re for seeing the bigger picture and seeing a healthy child whose brain needs a lot of sleep to function well and to develop well. We’re seeing the kindness in being confident in our approach and clear and predictable. One thing I like with parents, when they’re going through the routine with their child at the end of the day, what they’re going to do, I even like saying, “Then as I’m saying, ‘Goodnight, my darling, I love you’ and I kiss you and I walk out the door, it’s okay if you want to yell at me right there and say, ‘No!’ That may be something you need to do.” What that does is it helps the parent feel better about what we’re doing because we’ve let our child in on this as an okay part of the experience together. It helps our child to say, “Okay, well, this is part of the script. I can do this.” Then I know what she’s going to do in response. I know how this story is gonna end. It’s a very comfortable, settling feeling for a child to know what’s going to happen and have that predictable routine. Lisa Sunbury: I think that’s so important that with your son he was expressing a want or a need and you were responding. You made a conscious choice that this is what will work for him and it will work for us. If what you’re doing is working for your child and it’s working for your family, then there’s no need to change anything. But if it’s not, then you need to look at what’s happening here and how can we meet the needs or the wants of our child and meet our needs and wants, too. It sounds like this parent is saying it’s not working for her. Initially, when they made the switch to the bed, it was fine with her when her daughter came in and she was fine sitting with her and reassuring her. But now, it’s not working and she’s spending hours and her back is hurting and she hasn’t gotten a good night’s sleep in six weeks. It’s taking longer and longer for her girl to go to sleep. The crying is still happening. It’s not working. Then we need to look at, “Okay, what’s needed here?” The point you made about telling your child, no matter what their age is, to tell them exactly what will happen, “We’ve been doing this and it’s not working. Tonight, when you go to bed, this is what is going to happen. You might not like it and you might need to cry, and that’s okay. You can cry and you can tell me. We’re still going to do it this way.” They know exactly what to expect. 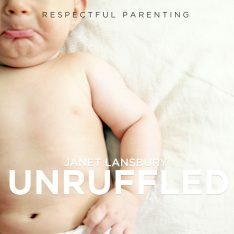 Janet Lansbury: I believe also that, to children, this is what they know, where they’ve slept, where they’ve been cozy. This is their nest. This is their wonderful little nest. It’s not a negative thing, it’s a very nurturing, positive thing. It’s important for parents to try to see more from the child’s perspective instead of projecting an adult perspective. I think that will help a lot. Even making the bed where she’s transitioning to into a cozy nestlike place, having little bumpers around it or pillows around it, or somehow nesting it in a little. Maybe even putting a, what are they called? The little gate, the little small gates to keep children in, just one of those to help the child feel cozy and nested in this space. 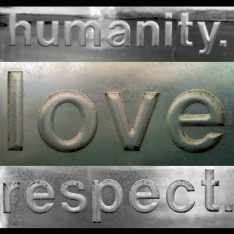 Lisa Sunbury: That’s so important. Sometimes it’s a loss of the crib, which is cozy and nestlike feeling. Sometimes they don’t know what to do with all that space and all that freedom, especially again at the younger age. Recreating that nestlike feeling, the gate at the door is one way. One family that I know, they’d always had a floor bed for their child. They had a play yard around the bed and that created this cozy, contained feeling even though they had a floor bed. The other thing that’s helpful is a privacy pop tent. That’s something that, for my girl, she’s five now but when she switched to a bed at three years old she had a tremendous difficulty. She used to wake at 1:00 in the morning. She’d go to sleep fine and then she’d wake at 1:00 in the morning and she’d be up there playing, then eventually calling to me. What it was was without her crib, without that feeling of containment, she didn’t know what to do with herself. We gave it good try. We gave it a good try for a couple of months, but she couldn’t go back to her crib because she was climbing out. She was three, she was ready. She was showing me in so many other ways that she was ready. I ordered one of these. I saw this privacy pop tent online and ordered one, and it’s made a tremendous, tremendous difference for her. Even now at five years old, she’s happy to go into that little cave, that little nest. She still has a gate at her door and she’s been able to, since she’s been about three and a half years old, open that gate herself, chooses not to. Recently, I thought, “Well, maybe it’s time to not have the gate there so that she can go to the bathroom if she needs to.” It didn’t work for her. She asked for the gate back. She wanted that gate even with the privacy tent in her room. Also, in terms of I just wanted to speak a little bit to what this mother was asking about if she does get up and leave the room. Let’s say that you don’t have a gate or maybe your child just climb right over the gate or you’re not comfortable closing your door for whatever reason, then really the only option is to, without any emotion or putting any interest in it, just returning your child right back to bed. Lisa Sunbury: As many times as it takes. Janet Lansbury: As many times as it takes, exactly. Sleep is such a hot button issue and there are so many people out there telling you that this is the way it has to be done and your children have to sleep in bed with you or they shouldn’t sleep in bed with you or they need to do this or they need to do that, and I know that because every time I put up any kind of post that’s a response to a parent’s question about sleep that’s intended to be totally helpful, there are always a bunch of people with angry faces disliking it because it’s not how they believe sleep should go. Well, the only rule for sleep in Magda’s approach is that it helps the children and the parents to get as much healthy sleep as possible so that we can all thrive. We’ve got to put the oxygen mask on first. Sounds like this parent maybe needs to hear that, that yes, you’ve got to take care of yourself here. You’re not going to be able to do your job well unless you do, and that’s really important. It’s not whatever we perceive are our children’s wants over everything, it’s got to be taking care of ourselves so that we can be that good leader. That’s what love is. Yes, these are tough issues for people because they’re very emotional ones, too. I think the end of the day, we really want everything to be nice and sweet so we can go off to bed feeling good. It’s challenging. Lisa Sunbury: You just hit on one of the biggest difficulties. 20 years working in infant/toddler programs and working as a nanny for families and I’ve helped countless families with sleep. I didn’t have difficulty with hearing a child cry. Then when it was my daughter and she was up there screaming that she wanted me to come back, it was a good thing I had someone here holding my hand and telling me, “Wait. Just wait a few minutes and trust.” But you want the end of the day. But also that if you’re clear within yourself what you’ve decided is best for your child, best for your family, for yourself, and you’re clear with your child and you’re consistent with carrying out your plans, [inaudible 00:21:44] whatever you do is what they come to expect. Infants and toddlers, if they can count on you to do what you say, they are able to relax. They don’t have to test and push, but they need to count on us to do what we say we’re going to do. If you’re making changes, you have to be clear within yourself and you have to have a plan and you have to be willing to stick with that plan and know that by doing that, you’re doing your child a service. The protest, the difficult period, will pass more quickly. Infant sleep, toddler sleep, it’s constantly changing in the first couple of years. People talk about sleep regressions, but I don’t like that word. They’re changes. It’s a sleep progression. They’re maturing cognitively, emotionally, [throws motor 00:22:35], and there’ll be times when sleep is more difficult for any number of reasons. Again, a transition from a crib to a bed, your child might need more support at that time. But I think where parents go wrong is that what should be a temporary transition becomes this ongoing way that we sleep that we never wanted. Janet Lansbury: Right. That creates resentment and bad feelings for us with our child that really aren’t our child’s fault. But it’s our fault for wanting to give into pleasing them and then we’re the ones that feel annoyed. One other thing this parent said is about being scared. That’s another thing. We think that night is this scary time. I’m a night person, or I used to be before I had kids, at least. Now I’m not. Janet Lansbury: Or, “You’re tired. Lisa Sunbury: “You’re tired.” “No, I’m not!” They need to push against that. Lisa Sunbury: Magda used to talk about helping them to connect to time because a 21-month-old is very much just learning today and tomorrow. During the bedtime routine, telling them the story about what happened in their day and now it’s time for you to rest. “I will be so happy to see you when you wake up in the morning and we will do” whatever it is. “We’ll have breakfast together.” That helps them to hear the rhythm of the day and to understand the continuity from day to night and to day again. Janet Lansbury: What would you say to this parent if you could only give them one bit of advice? Lisa Sunbury: To trust their child. To trust that she can do this and she doesn’t need you there for hours on end. Lisa Sunbury: Let her know what is going to happen and then follow through with that. Be consistent with it. The only thing worse than doing nothing is to start to do something different and then go back on it. Janet Lansbury: Yes, have conviction. That doesn’t mean that you’re stuck with something forever. You can change your mind with conviction, as well. Lisa Sunbury: But give it a good try. Do you know what I mean? Give it a good try because this is often what happens. It’s like, “Oh, no! She’s not sleeping!” Parents get desperate and then they start trying a lot of different things and all that does is confuse it for the child. Okay, Lisa, I hope that helps this parent. Oh, my gosh, thank you so much for being here and sharing this issue with me today. Please come back again. It seems like we could talk forever and I would like to do that. Lisa Sunbury: I would like to do that, too. I can’t wait for our event on October 7th. We’ve been talking about doing it for so long it’s only taken us three years. I’m so honored and I’m so excited that you’re going to be here in Santa Cruz. Janet Lansbury: Me, too. I can’t wait to see your beautiful daughter again, as well. Thank you, seriously, Lisa. Thank you so much. Thanks so much for listening. We can do this. Wow! Cry it out considered healthful! Or could the child be communicating that after only being in the world for 2 years that he/she actually just needs to be in a loving parents arms to feel safe and relaxed. As an adult if I was crying in a room i would hope someone would come and hold me and help me feel better. So as a toddler I would expect the same. What a completely neglectful approach to leave a baby crying in their room when they clearly need a loving embrace! How is this tosh allowed to be published. Love your children don’t leave them crying!! There’s mention of confusing a child. It’s my personal opinion that all that talk is confusing to a child (especially at 21 months). All they know in the middle of the night is that they need to know that an adult/person that cares for them is in very close proximity. They haven’t developed the reason or logic capabilities to understand why their person isn’t responding to that specific need. It’s quite disrespectful to to see this from their perspective and respond to it accordingly. I don’t see the harm in simply letting the child sleep closer to the adult. My husband and I remind each other that this is a short time in the span of our lives and it takes ample nurturing to help build a confident enough child to sleep on their own, especially in a separate room. I’ve heard from multiple other parents that it’s how they also get the best cumulative sleep (to sleep close to their little one). But, of course, to each their own. There’s no one way, but sleeping together with young children is also the way most of the world does it (and those without huge houses full of multiple spare bedrooms as we have in the U.S.) and also how our ancestors raised children so it can’t be too terribly off course. I found many parts of this helpful but I really need some suggestions as well. We stopped giving our 2 year old her pacifier a couple weeks ago and since then she has stopped napping and has much difficulty falling asleep at night. She has gotten to the point where she is (expectedly) resisting the naps so much that she will take her clothes/diaper off in the bed. Then I’m repeatedly going in there trying to dress her. I know she’s not ready to drop the nap because in the afternoon she is SO tired she falls and hurts herself and does things that wouldn’t normally happen when she used to be rested. There is so much that I love about the RIE approach and your work specifically, Janet. However the area of sleep and RIE is something that I find repeatedly disturbing to my deepest sense of what is appropriate for babies and small children. Of course we’re all free to make our own parenting decisions here and I respect alternate points of view, however I felt compelled to share the perspective that there are other ways to be with our children’s sleep that very much reflect trust in the individual child. I feel there is a more mutually respectful approach possible than was offered in this podcast by Lisa Sunbury. Lisa’s perspective is not what I understand Magda’s approach to be (as was also referenced during the podcast), but rather an interpretation based on culturally common asumptions about the rights and responsibilities of patenting that unfortunately don’t translate well at all with the known neurobiological development of small people. Thank you for the opportunity to reflect on this topic. I am grateful we made different choices for our son.